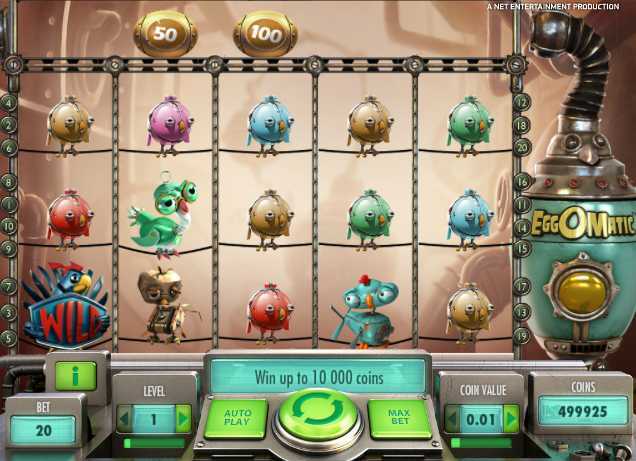 May 23, 2013 (Press release) – Net Entertainment has hatched its latest platinum video slot named EggOMatic™. Mr.Green Casino :: EggOMatic video slot - PLAY NOW! This new offering from the world’s leading provider of high-quality online casino games is set against a backdrop of an automated chicken coop where eggs are created by a metallic EggOMatic™ machine. These prize eggs trigger either coin wins, Spreading Wilds, Free Spins, or even a Surprise Egg, which contains any one of the prizes. The winning eggs then make their way from the conveyor belt onto the Rooster, who first catches the egg and breaks it open to reveal the prize. A win is followed by showers of golden coins, ambient sounds and colourful animations that give players an abundance of chances to build their nests. EggOMatic™ is a 5-reel, 3-row 20-line video slot with Wild substitutions, Free Spins and prize eggs. EggOMatic™ :: You can try this NEW Slot game right now at the following casinos: Unibet Casino, Vera & John Casino, ComeOn Casino, Mr.Green Casino, EuroSlots Casino and RedBet Casino.